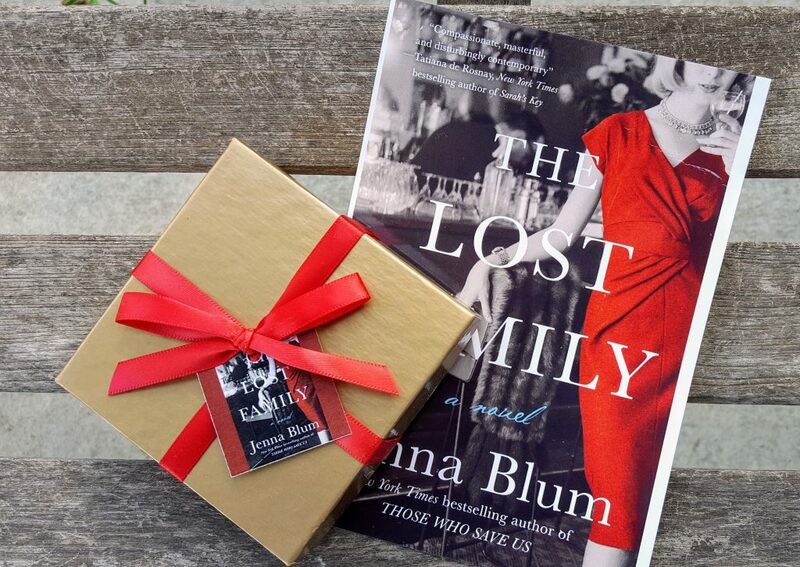 I am thrilled to participate in BookClubCookbook.com’s The Lost Family Supper Club blog party, to celebrate the launch of Jenna Blum’s The Lost Family! The Lost Family is a novel about a German-Jewish Auschwitz survivor named Peter Rashkin, who emigrates to New York, starts a restaurant, and falls in love—only to find his new American family haunted by the wife and daughters he lost during the war. Really, Peter is like Ferdinand the bull, except instead of wanting to smell the flowers, all he wants to do is cook. He was training as a chef in Berlin when the Nazis came to power; in America, being in his kitchen at Masha’s, his 1965 Manhattan restaurant named after his lost wife, is his happy place. The menus in The Lost Family are a fusion of 1965-era favorites and German-Jewish comfort food, Peter and Masha’s favorite childhood dishes: Masha’s “Little Clouds” (cream puffs with chocolate fondue), Brisket Wellington, Chicken Kiev, and my favorite, Masha Torte—an inside-out German chocolate cake with cherries flambé. There’s also a Hamburger Walter, invented for news anchor Walter Cronkite when dining at Masha’s, served Au Poivre with No Vegetables At All (my dad was a newswriter for CBS and he told me this was how Walter liked his hamburgers). I LOVE FOOD, and I had a joyous time creating and kitchen-testing all the recipes for The Lost Family, relying on my German friend Christiane’s mother’s recipes, my childhood memories of my Jewish grandmother’s dishes, the Mad Men Cookbook and similar cookbooks from the 1960s, and ingredients from my garden. I worked in food service for many years as a waitress and a prep chef to subsidize my expensive writing habit, but I’m not a chef, so there were some notable cataclysms, for instance throwing ice cubes into the oven to create crispy baguettes for Peter’s crostini (explosions) and dropping an entire Masha Torte on the floor (flaming explosion; we ate it anyway, and it was good!). This novel has three distinct parts told from one of the three main characters’ points of view. The tragic Peter starts the tale. After a horrific start to his adult life in Berlin during the Nazi regime, he creates a new life for himself in 1960s New York City and becomes a darling of the media and socialites with his restaurant, Masha’s (named after the young wife he lost during the war). At Masha’s, he meets June Bouquet, an up and coming model. (Her darling name is pronounced “bucket” in her Midwestern home town.) June is running from something as well. June takes over the middle part of the book after she leaves her modeling career behind to help Peter in the restaurant. Soon they start a family when little Elsbeth enters the scene. June does not take to suburbia or motherhood well. I had little sympathy or understanding for her, especially when she starts her dalliance with the club’s tennis pro. The first third of the book was the most enjoyable for me. In fact, Blum could have ended the book there and I would have written many accolades for the novel. There’s a few loose ends (like the whole Jewish “mafia” angle) that I would have liked to have seen explained. Then there was my dislike for June that occurred in the middle of the novel. All in all, however, I did enjoy the book and will recommend it to friends. Blum starts out with a heavy emphasis on food as Peter’s restaurant flourishes. There’s elaborate menus from the restaurant to highlight Masha’s specialties. During the June segment, food wasn’t a focal point. During Elsbeth’s tale, food was a specter that first assailed her and then haunted her. As I read with a focus for an inspired-by recipe, I discovered Hamburger Walter, a Thanksgiving feast, ficelle and challah, Little Polish Doves, Norwegian delicacies, Peter’s pickles, and his scrambled eggs. In the end, I decided to make my version of Hamburger Walter, Peter’s menu item from Masha’s and Walter Cronkite’s favorite. 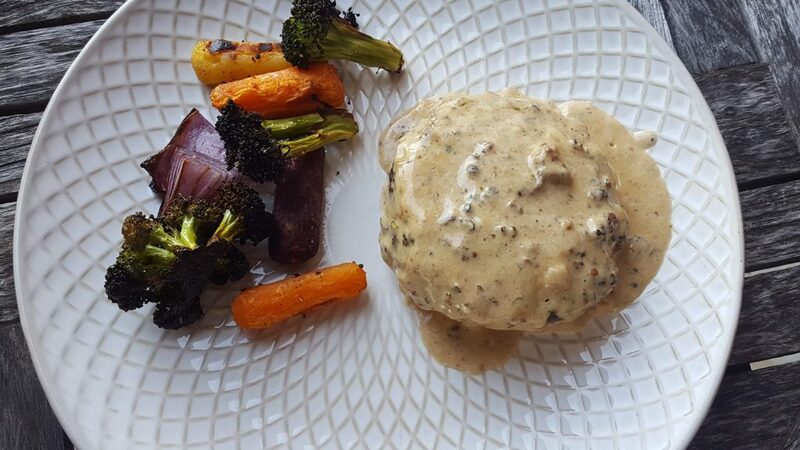 My version of Hamburger Walter is just a basic Steak au Poivre recipe, swapping out the filet mignon for cheap chuck patties (and adding veggies). Inspired from The Lost Family and Masha’s. Walter Cronkite dined on this meal at Masha’s (sans the veggies). Sprinkle both sides of the patties with salt. Coarsely crush the peppercorns with a mortar and pestle. Spread the peppercorns evenly onto a plate. Press the patties, on both sides, into the pepper until it coats the surface. Set aside. In a medium skillet over medium heat, melt the butter and olive oil. As soon as the butter and oil begin to turn golden and smoke, gently place the patties in the pan. For medium-rare, cook for 4 minutes on each side. Once done, remove the patties to a plate, tent with foil and set aside. Pour off the excess fat but do not wipe or scrape the pan clean. Pull the pan off the heat, add the 1/3 c. of brandy and carefully ignite the alcohol with a long match. (Reserve the remaining 1 t. of brandy for later.) Gently shake pan until the flames die. Return the pan to medium heat and add the cream. Bring the mixture to a boil and whisk until the sauce coats the back of a spoon, approximately 5 to 6 minutes. Add the final teaspoon of brandy and season, to taste, with salt. Add the patties back to the pan, spoon the sauce over, and serve. Serve with vegetables of your choice. I chose to roast some broccoli, tri-colored carrots and a small red onion. Preheat oven to 450 F. Toss chosen veggies in olive oil and season well with salt and pepper. Place on a foil lined baking sheet and roast for 20-22 minutes. Remove from oven and serve. Please don’t let my dislike for June keep you from this novel. I devoured it in no time flat. Thank you, Ms. Blum, for the lovely and delicious chocolates and the fantastic recipe for Masha’s Torte (Dark German Chocolate Torte with Cherries Flambe). Note that I will definitely be making this delicious sounding dessert! 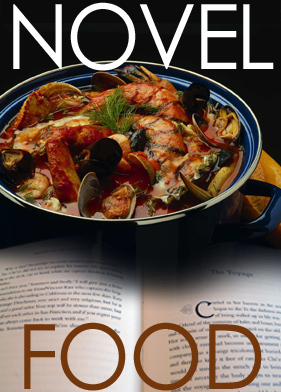 I am linking up with Novel Food and Foodies Reads. Sounds like a wonderful book. The patty looks really great with that creamy sauce. I plan to try my a Walter burger this summer, but I really wanted to bake. Poor June . . .
You left me wondering: was there a real restaurant named Masha’s where the real walter Cronkite ate? Or is it all fiction? As for the recipe: somehow I never like the taste of the fat that comes out of ground beef, so I would not be inclined to make a sauce with the pan drippings as I do with steaks. I didn’t care for June either but I didn’t hate her. I actually felt more sorry for her than anything else. She was so desperate and insecure that she came across cold and distant. Love the Burgers au Poivre. Your hamburger Walter looks so good! It was fun partying with you! We did agree on the book. 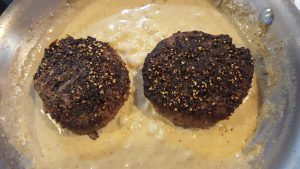 Great minds… 😉 Your burger makes me want to eat meat again–the au Poivre sauce…yum! We always called him “Uncle Walter” and in this case I admire his dinner choice. I haven’t had much experience with German dishes but perhaps the info in this book can serve as a guide.